Butter slices of bread and on one unbuttered side, place a few slices of cheese, then pear slices, topped with cheese slices. Top with second slice of bread, unbuttered side toward sandwich fillings. 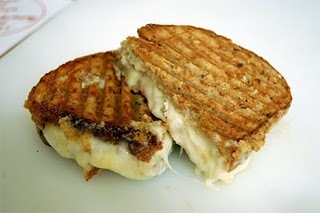 Place on prepared griddle; grill for about 1-2 minutes, until lightly browned, then flip and cook until second side is lightly browned and cheese is melted evenly. I sometimes remove from heat and place a lid over the sandwich to make the cheese ooze even more. Delicious greetings everyone! I hope this week finds you and yours somewhere happy and safe ... she writes as LA decides whether to rain or not... but never mind that. I want to jump right in and share some really good things! Where to buy the "Michelangelos of Pasta"
It gives me great pleasure to let you in on where to buy the "Michelangelos of Pasta", in person, or online! If you're local, you will love shopping for Pappardelle's Pasta in the plaza near the main clocktower at the Original LA Farmers Market, every Friday, Saturday, and Sunday. For over 25 years, they have offered more varieties of fine-quality gourmet frozen and dried pasta (including flavorful lasagne sheets), pesto and sauces, than any other maker. Their products boast handmade, rich-textured ravioli fillings and the artisan practice of small batch methods like slow-drying to ensure vitamin and protein integrity. If you like your pasta as much as I do, you will love their vast selection of flavors that include Tunisian Harissa, Rosemary Garlic, Four Peppercorn, Basil Tangerine, and Summer Herb. With extended offerings like Organic Whole Wheat and Gluten-Free Trumpets, theirs might become a must-stop at LA's best grocery store! Specialty oils and amazing balsamic vinegars by Bella Sol would round out your purchases nicely! Visit them online for recipes and to learn more, or stop to chat with Kyle and Vanessa at the Market soon! Lisa and I are excited to be expanding our relationship with the West 3rd Street Business Association in the weeks to come. For now, we all want you to know that parking on the street while you shop and dine on weekends, has just become a dream come true! For $4 all day (plus tip), you may drop your car with one of 3 valet stands between Fairfax and LaCienega, and they will deliver your car to you wherever you end up! You may love to know that fabulous new merchants are filling up spaces in the most beautiful of ways! Last week we became acquainted with D.L. Rhein, an exquisite feast for your senses with unique designs, jewelry, aromatherapy, and even chocolates made in the Mayan tradition. Marcelita L'Art et le The' is a new tea salon and floral design boutique with French-Argentine owners who are delightful. Consider a day in the city to explore what's new ... now you can park easily, and you already know where to eat! Or, let us know if you need recommendations! And finally, many of you have waited patiently for the Grilled Pear and Cheese Sandwich I refer to each time I chat up Monsieur Marcel's Cantalet cheese. April is apparently Grilled Cheese Sandwich Month, so here is my contribution to this fine culinary moment in history! I will leave you with that palate teaser, and wish you a fantastic week ~ ideally filled with time around the table surrounded by those you love!